FREE! Restaurant for Lease in Commercial Area - Shorter Hours! We have a great opportunity for an experienced restaurant operator. This restaurant is currently operating as a Deli and Catering business. The current short term tenant is leaving this October. "Please do not talk to current tenant or employee's"
This facility has plenty of space at 3,000 sq. 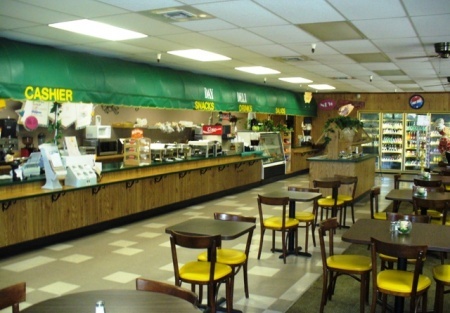 ft., lots of seating, a salad buffet, a walk in cooler and more all included with the lease to use. There isn't a hood at this time, but perhaps one could be added at the tenant's expense. This is an opportunity to expand your current business or start one ready to go. You really don't need much, but your experience and working capital. The current landlord is offering a percentage lease at 10% of gross sales for the first 6 months rent plus CAMs to get the new owner off to a good start. The previous long term tenant's sales sales notes found by the landlord. These of course aren't verifiable, but something to note. That tenant was deported due to personal circumstances. This is your opportunity to get into a great space built to handle the hundreds of employee's nearby and make a good income. The first months scheduled rent and deposit are due at signing. Applicant will need to fill out a profile of experience, proof working capital and have good credit. This is your chance to get a nearly turn key facility and use your working capital to advertise and build the business.